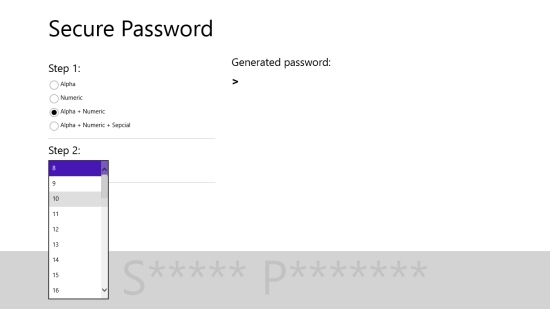 Secure Password is a free Windows 8 Password Generator app that lets you create unique and secure passwords using letters, numbers, and symbols. With this app, you can select password strength and type/ complexity level and generate a password that is unique and difficult to crack. 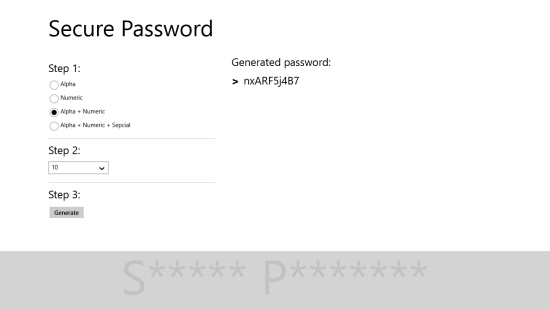 This free Windows 8 Password Generator app is a simple yet efficient tool and requires minimal inputs for creating strong passwords. You can use this app to create passwords that are alphabetic, numeric, alpha-numeric, or a combination of alpha-numeric, and special characters. Thus, you can select your complexity level to get the desired password. Secure Password is freely available under Tools category of Windows Store. You can download this app using the link given below at the end. 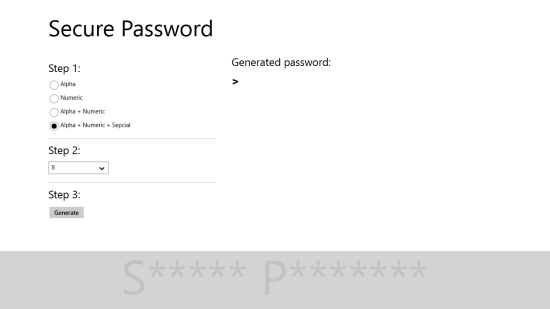 Let’ see how to use this free Windows 8 Password Generator app. Secure Password is a single screen app that lets you create unique and strong passwords by following three simple steps, as directed by the app. You will find these steps on the main screen of the app itself. Step 1 – Select password type/ complexity level. That’s it! You unique password will instantly display on the screen. You can copy this unique password and paste it anywhere. Also try some other free password generator apps and some free password manager apps we reviewed earlier. Secure Password is a useful tool to create highly secure passwords that are really difficult to crack. Give it a try if you are looking for an app like this one. Do share your feedback via comments.